His expert guidance and utmost discretion ease the difficulty of these sensitive and often complex transactions. 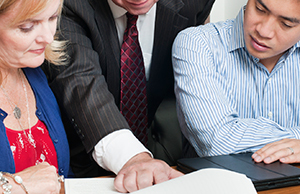 When litigation is called for, clients have confidence in his wealth of experience. He has successfully provided representation at the Massachusetts Appeals Court concerning domestic relations issues, and has appeared in the Essex, Middlesex, Plymouth, Suffolk and Worcester Probate Courts.